A nostalgic look back at the railways of South Shropshire in the early 1960's. After a visit to GOBOWEN and IFTON colliery in the north, the scenes south and west of SHREWSBURY are covered. A journey from WELSHPOOL to SHREWSBURY, most of it in Shropshire, is taken. Very rare 1932 footage of the SHROPSHIRE & MONTGOMERY RAILWAY shows LNWR 0-6-0's, llfracombe Goods engines and petrol railcars between SHREWSBURY ABBEY, KINNERLEY and the CRIGGION branch. A comprehensive journey the whole length of the Severn Valley now follows via BERRINGTON, CRESSAGE, BUILDWAS and IRONBRIDGE. The line to LONGVILLE and MUCH WENLOCK is recalled as is the eastern side of the River Severn at DAWLEY and COALPORT in 1959. 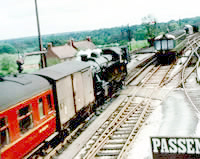 Steam at BRIDGNORTH before preservation.and on past HIGHLEY and ARLEY to BEWDLEY. The line through the Wyre Forest to TENBURY WELLS and WOOFERTON with steam hauled passenger trains and Western railcars, a return journey along the CLEOBURY & DITTON PRIORS line is shown. Next a round trip from BEWDLEY to KIDDERMINSTER, HARTLEBURY to STOURPORT, before it lost its steam service, and at the end the last day DMU operation before the line was closed. A return journey on the KIDDERMINSTER to WOOFERTON pick-up freight with a Prairie tank leads to the south west corner of the county to see a Jubilee working from KNIGHTON to CRAVEN ARMS, all in the county of Shropshire.